‘Taruu’ depicts the energy flow from the sky to the lake as it is channeled through brilliant gilded living beings studded with jewel tones and real 22 carat gold leaf. Tanjore Art has always been a rich, respected tradition from the South. It has always been protected and framed behind glass to enclose & preserve the 24-carat gold and precious stones that adorn the painting. 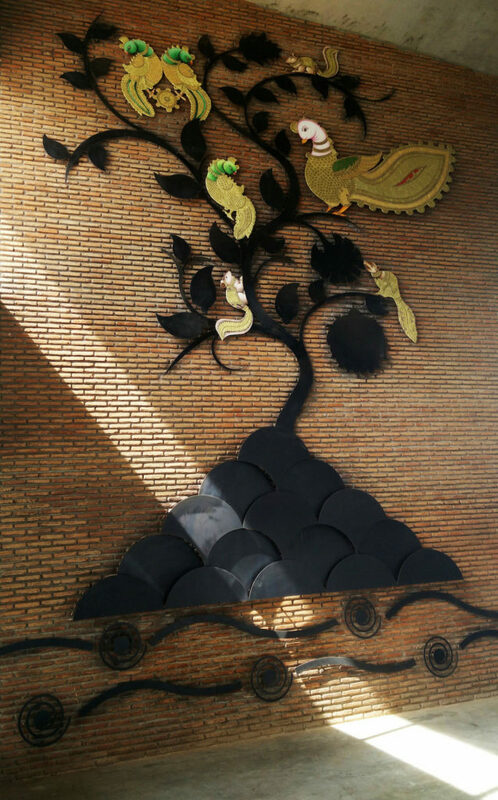 We devised a way for the painting to be coated with a specialized resin to expose the art and make it a free edged structure instead of its rectangular framed look. 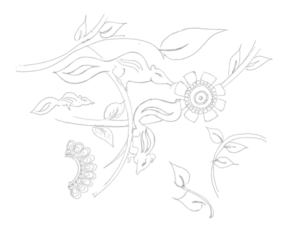 First sketch depicting the squirrels which were finally crafted in Tanjore style art as part of Taruu. 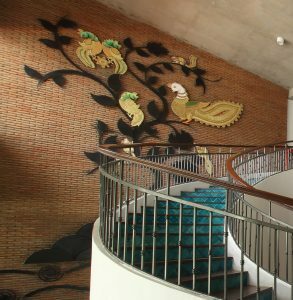 Using typical Tanjore topics like an annam, green gilded beings and trees, the art on the wall complements the curved staircase that resembles the feathers of the majestic peacock.